1. 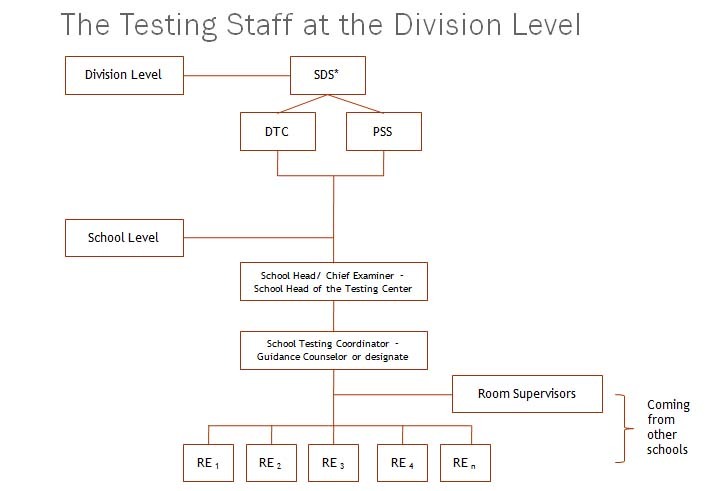 Assignment of the testing staff shall be done by the SDS. 2. The NAT is administered in the respective school of the examinees. Assigns the PSS to manage the tardiness of some private school teachers on examination day. Records pertinent data about the TMs released to and received from the REs in the Accounting Form (Form 3) and Forms 4, 5, 6 and in the SSH. Follows the instructions in the Accounting and Packing of TMs found at the latter part of the EH. Note: The School Head is the Chief Examiner of his/her respective school. Signs Form 3 as he/she receives the TMs from the CE/STC while still inside the Distribution Room. Teachers from private schools will be assigned in public schools as REs. Likewise, teachers from public schools will be assigned in private schools. If teachers are not enough, those from other districts can be assigned. Public school teachers from other districts may serve as REs when there is insufficiency on the number of private school teachers. For divisions with only few public and private high schools, elementary school teachers from public schools may serve as REs. Teachers from big schools may be dispersed in small private schools. The number of RSs assigned in a testing center will depend on the number of examinees in a testing room. Note: The STC stays in his/her respective school to assist the Chief Examiner in all the testing activities. This is primarily aimed to orient all the testing staff in the NAT administration. But due to budgetary constraints only one representative per school is authorized to attend – either the SH or the STC. However, a 100% attendance is imposed for the school representative. Sanctions should be meted out for non-attendance. Hence, a mechanism should be devised so that all testing staff are properly oriented; one of which is orienting all the teaching force in the school by the SH/STC to be ready on exam day in case there will be shortage of REs in other testing centers. We would like to see the LAPG REsults 2016.
good pm. can we have copy of NAT result of our school? un mkita po ang individual ratings.salamat. good pm. can you provide us the NAT result SY 2014-2015 of our school Doña Francisca Lacsamana de Ortega Memorial National High School – Casacristo Annex, Cadapli, Bangar, La Union, School ID 300115. Can you please give me a copy of NAT 2014 Result of Toledo City Science High School? I need the list of least learned skills po. Thank you po! Hello can we have a copy of NAT result 2016.
hi.. tanong lang po, anong paper ang dpat gmit kung magpiprint ng answer sheet. Hnd b pwede coupon bond? Good morning. Can I have a copy of 2013-2014 NAT result for both Grade 3 and Grade 6? Anda Integrated School (formerly Anda Central School) school ID 101202. You can send it to [email protected]. Thank you very much and more power. Good afternoon sir/ma’am. I am Ma. Jesyca C. Vargas of Virac, Catanduanes, a teacher of Buyo Integrated School. Currently, I am conducting a research about effects of video clips in teaching Science. May I request from your office or email add a copy of NAT result of S.Y. 2O13 – 2O14 and 2014 – 2015 for every subject obtained by 4th year students in the Phil. for the datum is needed in my research. It’s very difficult to find it in the net. Please send it to my email add if you have the copy. I will highly appreciate your response to this request. Thank you very much. where can i download the form of accomplishing the seat plan BEA Form 2? sir gud afternoon. ask me if you have a sample of 2016 nat 6 answer sheet and school header. thanks. Good Morning Po.May I request for the NAT Results Region 7 Central Visayas Jubay,Liloan,Cebu School ID # 119412 for the S.Y 2013-2014 Grade 6?Thank You for your quick response. mam/sir im richard a escabarte.from cavite….2nd yr high school po natapos ko…31yrs old n ako..pwede po mag exam..para 3rd and 4th yr high school…..
the test in lapg was good!!!! Maam Gigi..welcome po! share niyo din po sa mga co-teachers niyo. Salamat! can you please tell me where can i find the National Achievement Test questions. May iuupload din po kami ngayong araw.